I'm not much for organized travel. Rather, the ideal trip for me involves flying into developing country X (preferably sans return airfare), with a guidebook, a backpack, and a sense of "well, we don't really have any reason to be here, so let's make the best of it and see how things go". I've had a lot of incredible trips fitting this mold, and hope to continue taking trips like this for many years. Like Shooting Fish in a....Pond? This past weekend we had a "company sponsored holiday", which involved a 4-day trip to Hangzhou, Suzhou, and Shanghai. Now for those who have actually traveled in their lifetimes, you'll notice that this is a 3-city trip in 4 days. That is to say, there is a 0% chance that we were actually going to "see" any of these cities, it was just going to be "get on the bus, get off the bus" for 4 days. I sort of expected this, as it's a very Chinese style of travel, and tried to mentally prep myself for the rather ho-hum nature of this type of trip. But my god could I have never prepared myself for what went down that weekend in the Yangtze River Delta. We left the office at about 5:30am on Thursday. 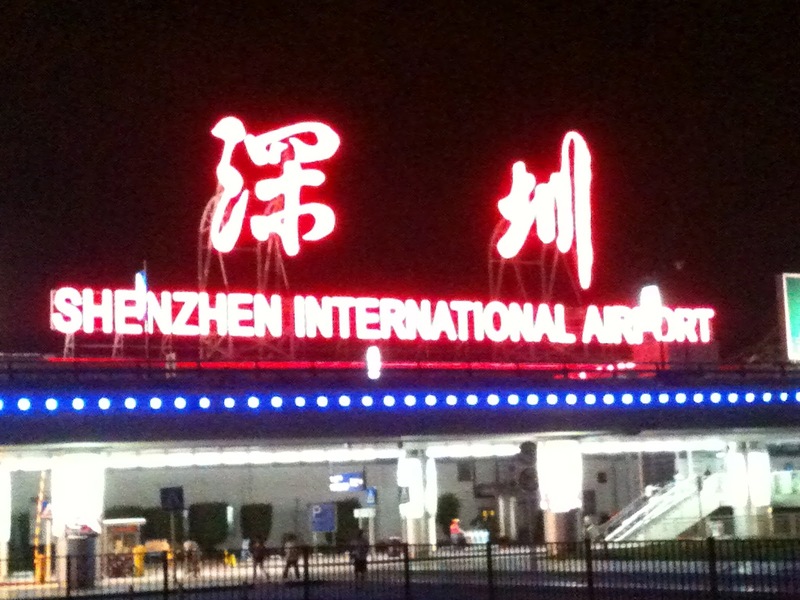 After flying from Shenzhen to Hangzhou, we were immediately hurled into a bus with a tour guide. A really. obnoxious. tour guide. He had a microphone with like a hip-speaker thing, and was yelling into it the entire trip. In very obnoxious Chinese. So that was pretty awesome. Our first stop on the trip was a pretty decent restaurant in Hangzhou, as we arrived about lunchtime. It was immediately obvious that I was going to be something of a "guest of honor" during this trip--I always sat at the head table, immediately next to the sister of the 2 brothers that own this company (the brothers were not on the holiday, and their sister is what I would refer to as the "Company Mom", just a really nice 40ish year old Chinese woman who speaks about as much English as I do Arabic....so she's pitch-perfect). Anyway, so we had a decent lunch. After lunch we went to the pretty amazing West Lake of Hangzhou, and took a very crowded touristy boat around the West Lake. Still decent. We walked around that area for most of the afternoon, before going to a sort of shopping street, then this bizarre Song Dynasty-themed Chinese amusement park/folk village/mental institution/song and dance theater. Yeah, it was all of the above. Weird first day overall, but nothing compared to the devastation of Day 2. Day 2. A brutal day for sure. We got on the bus in Hangzhou, and our first stop was a "silk museum". By silk museum, I mean a place where they tell you how silk is made, then spend an hour trying to convince you to buy some silk. And of course I'm in the market for silk scarves, bedsheets, and lingerie, if not this may have been a pointless excursion. That said, there was some entertainment when, on their map of the old Silk Road, they had labeled Kuala Lumpur as a city in Northern Sri Lanka (I assume they meant to say Colombo...) Anyway, so after this whole silk business, we went to an equally asinine place that was a "Chrysanthemum Tea Museum". Same thing, "here's our tea, here's how it's made, now buy some". Should also be noted that this was all in Chinese. And of course I"m in the market for chrysanthemum related products, otherwise this may have been a pointless excursion. From here, we went to a place selling various trinkets. And of course I'm in the market for that too, otherwise...well you get the point. Anyway, all these places were ~1 hour apart by bus (ferally hot bus as well), so by the time we'd been harassed to the point of wanting to stab the tour guide, the day was done and we were just arriving in Suzhou. A brief aside--I asked Lisa why the hell we had wasted 1 of our 4 days doing an unbelievable amount of shopping/completely idiotic activities. She informed me that this is how the tour guide makes money--he gets commission from the shops if we buy things. Frankly, I would be just as happy giving the guy like $10 (or even less, we could realistically each give him like $5, and the $200 he makes would be about 2 weeks' wage in China), and just have that extra day to not be assaulted by merchants peddling their crap. But apparently this is not how China works. Also quite interesting, none of my Chinese coworkers seemed fazed or aggravated about this absurd series of shopping misadventures. Day 3 was interesting, we went to a very beautiful old village called Zhouzhuang, which was definitely one of the coolest places I've ever seen. Appropriately named the "Venice of the East", it is world famous for its canal system, and I was pretty surprised and intrigued to find that many people were still living here despite it being a tourist-infested village. Another brief aside--days 3 and 4 of this trip (Saturday and Sunday) were absolutely mental from the standpoint of the INSANE NUMBER OF TOURISTS AT THESE SITES. And they were all Chinese. I had no idea that domestic tourism in China was such an enormous industry, but I can assure you that having 10 tour guides with 10 hip-speakers screaming at their tour groups inside a relatively cramped temple is not the greatest way to enjoy the historical relevance and general awesomeness of these places. But anyway, such is life when the country you're living in has 1.3+ billion people. So after our tours around Suzhou, we finally arrived in the center of the center, the economic heart of the People's Republic of China, one of my favorite cities in this world (as of now, currently #3 on my list behind Hong Kong and Seoul), Shanghai. Upon arrival, I left the tour group to go meet up with my old friend Douglon, who I had lived with for about a month in Hong Kong upon my return to Asia in October-November 2011. He's currently living in Shanghai and managing his Dad's building, the House of Roosevelt. I met up with him at the House, which was a surreal experience. Put bluntly, it is one of the nicest buildings on the nicest and most famous street in China's most cosmopolitan and expensive city. The building has a restaurant on the 8th floor, where we went for dinner. 1) I had already eaten dinner at this point. "Now Douglon, I've already had dinner. So can we just do some appetizers or something else light?" "Of course, no problem at all"
As it was Douglon, I should have known better. The next thing I knew, a waiter asked me how I would like my steak cooked. Sweet jesus. Before dinner, I ended up getting a text from Martin, the old friend that I'd met up with in Hong Kong a couple of weeks prior. He was in Shanghai, and came to meet us at the House of Roosevelt (he's also a good friend of Douglon's, so it was a nice reunion). We were also joined by another friend of Douglon's, a Peruvian girl who had grown up in Sweden. The four of us enjoyed a magnificent meal atop one of the nicest buildings in the city, with a beautiful view of Pudong/Lujiazui and The Bund. Or at least, the 3 of them enjoyed the meal, as well as the sight of me trying to force down more food after having already eaten dinner. Overall a fantastic evening. The following day, I went with some coworkers to a really interesting temple near the Wuxinting Tea House and Yuyuan Gardens. I'd been to the exact place almost exactly a year before, which was kind of cool. Following this, I ended up meeting up with another couple of old friends of mine, Madlien and Martin, who are currently living/working in Shanghai. We went to the French Concession, a beautiful, leafy, up-scale area of Shanghai, and had a few afternoon drinks. I then received a call from Douglon inviting us for an afternoon lunch/few drinks at the House of Roosevelt. It should be noted that they have the largest wine cellar in China there, and that Douglon, being a ridiculously good host, would not take a cent for the food or wine. Consequently, we had a fair bit of food and wine. The food was infinitely better than the night before, as this time I was not already horrendously full, and we had a couple of bottles of white wine/champagne. I was to meet with my coworkers at Pudong International Airport around 4pm. The House is around 1hr from the airport by taxi, and consequently when 3:45pm rolled around, we decided I'd best hightail it to Pudong. And so I did, but not before falling asleep in the back of the cab (too many glasses of champagne it would seem), only to be woken by a call from Jacky asking where I was (though to be fair, they didn't care that I was a bit late, as the weather was crap and our flight ended up being delayed a bit anyway). So that was the trip to Shanghai, Suzhou, and Hangzhou. As I noted in the beginning of this blog post, I tend to prefer trips that are completely unplanned. After returning from this atrociously constricting trip, I decided it was time to book something stupid, so yesterday I booked 1-way airfare from Hong Kong to Dhaka for the day after my birthday, as we have 1 week's holiday for Chinese National Day that week (I was really, really, really hoping to do Tibet, but unfortunately the Chinese government has closed Tibet to foreigners for the foreseeable future....welcome to China!). For those who don't know where Dhaka is, you clearly haven't been reading my blog often enough, as I wrote a fairly decent piece on Bangladesh last year. Anyway, so will be heading there for some amount of time in late September. Interestingly, that's the tail end of the rainy season, so should involve some flooding and perhaps malaria. And I cannot freaking wait.